2012 brought Hotline Miami, a brutal action game with an addictive rinse-and-repeat gameplay loop. In it, players must take their fragile character into areas filled with dangerous foes and clear them out without taking a single hit. It’s easier said than done, and this isn’t an idea that’s been copied until now, with Mr. Shifty by Team Shifty. Although similar-feeling mechanically, the devs replace Hotline Miami’s mind-twisting story and ultraviolent combat with a pun-filled, silly narrative where the main character can warp around like the X-Men’s Nightcrawler. 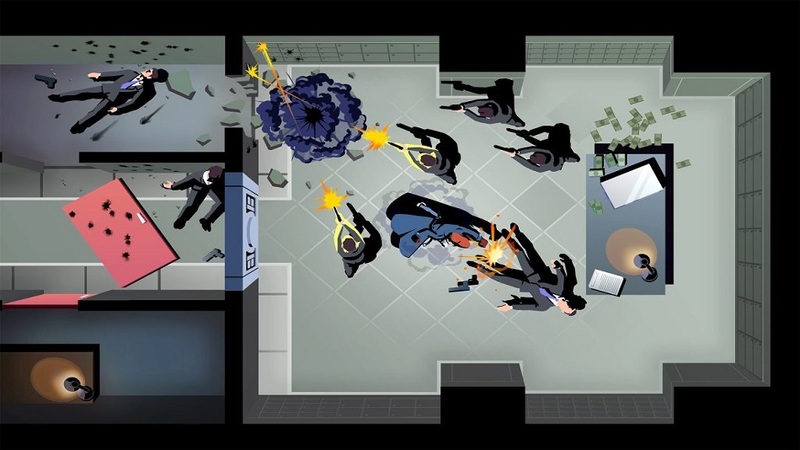 The titular character, Mr. Shifty, is a thief sent on a mission to steal valuables from the high-rise tower of the sinister Chairman Stone. He’s guided on this task by his handler, Nyx, who makes bad puns and pokes fun of videogame tropes through her dialogue. Shifty has two main tools at his disposal: punching things and warping short distances. 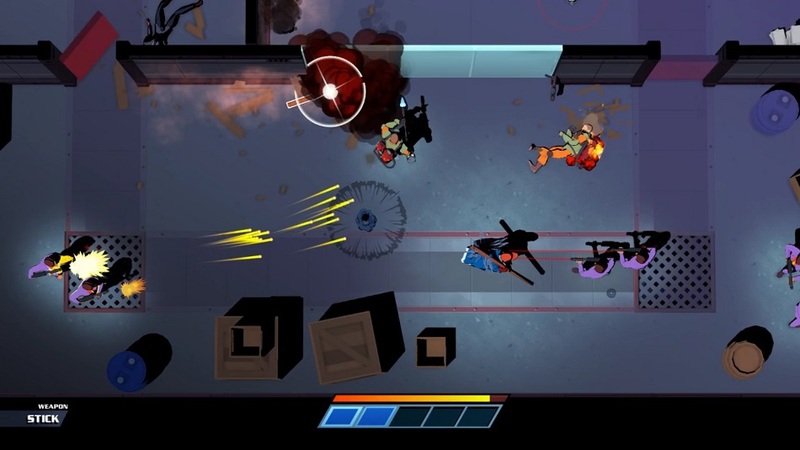 Despite enemies packing heat, Shifty sticks with hand-to-hand combat, which also includes tossing and swinging found items. Weapons don’t play a critical role in the game, but even a pillow can be thrown at a large guard to take him down in one hit. Other weapons like the staff can smash up a handful of foes before it breaks, and there are rare items — there’s nothing quite like having a line of enemies charging in and tossing a trident down their line, taking them all out at once. As important as smashing up foes is, dodging out of the way using Shifty’s warping ability is critical. This is not unlimited — only five warps are possible before a recharge is required, so players will have to use it sparingly. Considering guards often outnumber Shifty, it’s ideal to use this skill to move into an area where he can even the odds and take them out one at a time. It can also be used to move behind foes and to warp through walls to avoid gunfire, security lasers, or homing missiles. There are some stages where there are anti-shifting fields set up, so players can’t use it as a crutch through the whole game. Much like Hotline Miami’s main character, Shifty has a delicate constitution. One shot, explosion, or punch can mean the end. There will be times when fighting gets chaotic and it just isn’t possible to avoid everything, so there’s also a bar that fills as enemies are defeated. When full, this bar can slow time when Shifty is about to be hit. Move out of way, and things are fine… But honestly, sometimes death is inevitable. Thankfully, going down only means a quick restart at the beginning of the room. Some areas are larger than others, so it can get a little frustrating to make it nearly to the end of a massive section only to have to do it all over. However, none of the stages were so difficult that restarting became a major problem, it just made for a few tedious segments to work through. It’s also worth noting that there’s a bit of slowdown when the screen is filled with enemies, but it was never too problematic. The game also crashed once during five or so hours of play, but it happened at the end of a stage and no progress was lost. Disclosures: This game is developed by Team Shifty and published by tinyBuild Games. It is currently available on Switch and PC. This copy of the game was obtained via publisher and reviewed on the Switch. Approximately five hours of play were devoted to the single-player mode, and the game was completed. There are no dedicated multiplayer modes. Parents: According to the ESRB, this game is rated T and contains Violence. This game is aimed directly at teens and older, though the violence in the game is not graphic and there is no blood. Mr. Shifty will punch and kill foes, but they do not die brutally. He can be shot, punched to death, or blown up, but it’s very cartoony. Deaf & Hard of Hearing Gamers: All dialogue is subtitled, and audio cues are not critical to gameplay. I played most sessions without sound and had no issues at all. Michael is an avid fan of role-playing games, having been so since getting his hands on Final Fantasy and Final Fantasy IV in his younger days. Though he's been gaming since the Atari 2600 and NES, it wasn't until the SNES era that it really became a passion. He spent much of his childhood dreaming of designing games by crafting design docs in notepads and creating characters in his head. It wasn't until college that he really understood all the effort that actually goes into game design and quickly decided that he'd stick to just playing them instead. After graduating and getting a real job, Michael decided to fill his free time with game criticism, a shock to those who knew him and his weak writing skills. He persevered, practiced, and slowly worked his way up the ranks at RPGamer.com. After a few years, Michael took over as Editor-in-Chief of the site and still manages it today. In that capacity, he manages a staff from all over the world, organizes review schedules, plans features, and coordinates awards. All of that wasn't enough for Michael, though. He couldn't say enough about video games, so he branched out to other areas. He started his own portable gaming blog, Pocket-Console.com, to share his love of handheld gaming and to ward off the casual push to merge handheld game and mobile. He also wrote his first print piece for the now defunct PlayStation: The Official Magazine shortly afterward. Michael has now joined the fantastic crew at GameCritics.com in an effort to continue the crusade of "8 not being average" by providing fair and unbiased critcism.